Iranian Oil Tanker Continues To Burn After Saturday Collision Off China's Coast : The Two-Way One crew member was found dead, and 31 others are missing as of Monday. Rescue efforts are hampered by bad weather. The environmental impact of the crash was not immediately clear. The Iranian oil tanker Sanchi was ablaze Sunday after a collision with a freighter off China's east coast. One crew member is dead and 31 are missing, as rescue efforts are hampered by bad weather and the fire. "The tanker was carrying nearly one million barrels of ultra light crude oil to South Korea," NPR's Rob Schmitz reports. "The extent of the environmental harm and size of the spill is not yet known, but based on its load, it has the potential to be the worst spill from a ship since 1991, when a quarter-million tons of oil leaked off the Angolan coast. "Bad weather at sea has made both the rescue and cleanup efforts difficult, and authorities are worried the ship will explode and sink, leaking all of its oil," Rob says. The Panama-registered tanker Sanchi was steaming from Iran to South Korea carrying 136,000 tonnes of crude oil when it collided with a Chinese freighter on Saturday evening, sparking a massive fire, Reuters reports. The AP reports that an official in Iran's Oil Ministry said 30 of the tanker's 32 crew members were Iranians. "We have no information on their fate," he told the news agency. "We cannot say all of them have died, because rescue teams are there and providing services." State media reports that China dispatched several vessels to search for and rescue crew members as the vessel burned. South Korea also sent a ship and helicopter to aid the rescue and cleanup efforts. Meanwhile, China's Central Television reports, citing experts on the rescue team, that concerns are growing the tanker may explode and sink. The environmental impact was not immediately clear, and the Chinese government did not give details as to the size of the spill. The ship was carrying almost a million barrels of condensate, an ultra light crude oil. However, Reuters reports: "... the disaster has the potential to be the worst since 1991 when 260,000 tonnes of oil leaked off the Angolan coast." According to Reuters, "China sent four rescue ships and three cleaning boats to the site, South Korea dispatched a ship and a helicopter, while a U.S. Navy military aircraft searched an area of about 3,600 square nautical miles for crew members." 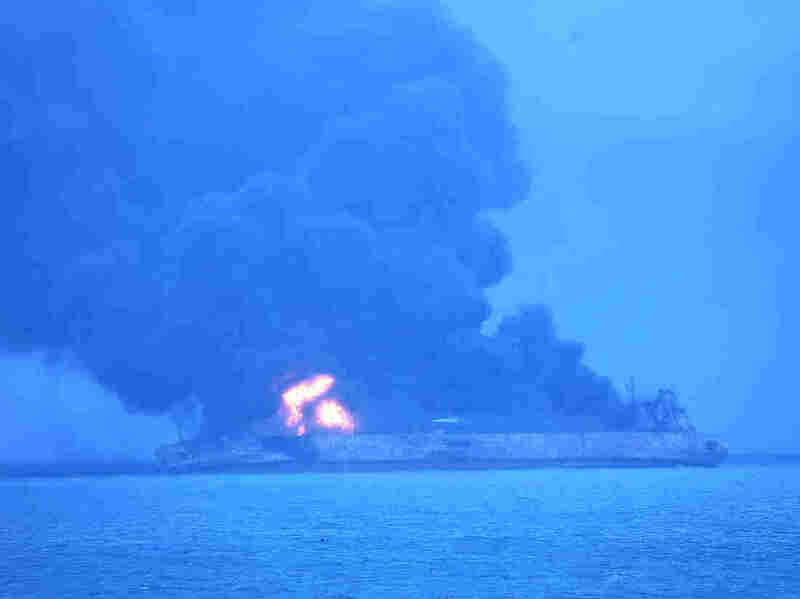 The AP reports that this is the second collision for the National Iranian Tanker Company in less than two years. In 2016 one of its tankers collided with a Swiss container ship in the busy Singapore Strait, though that incident caused no injuries or oil spill. All of the 21 Chinese crew members were rescued from the CF Crystal, which suffered only "non-critical" damage in the crash, according to Reuters.